Experience hot air balloon falconry | Unique & inspiring experience ever! Falconry is a part of Arab heritage. To the Bedouin people, who used the birds to hunt in the desert, they represented the spirit of adventure, unyielding strength and timeless beauty. This remains true today. Now, these majestic animals are part of an unforgettable experience that combines Bedouin tradition and the earliest form of aviation: hot-air balloon falconry. In the cool early morning desert air, flames burst from the burners of the hot-air balloon and the excitement is palpable as the balloon inflates. The balloon springs to life and the pilot calls for everyone to dash to the basket and hop in as it lifts gently off the ground, floating up, up and away. The sun rises and uncovers the vastness of the Arabian Desert. Camels and gazelles roam freely through their natural habitat on the ground below. In this gentle morning glow, the balloon ascends to 4 000ft. It’s time for the show. But the journey began many months before this moment, in a much colder environment. The falcons were hatched in Scotland, chosen for its cold climate, which is idea for strengthening the bird’s muscles and making them more agile and dynamic for flight. Hand-rearing from hatching caused the birds to imprint on their feeder, forming a strong bond of trust. 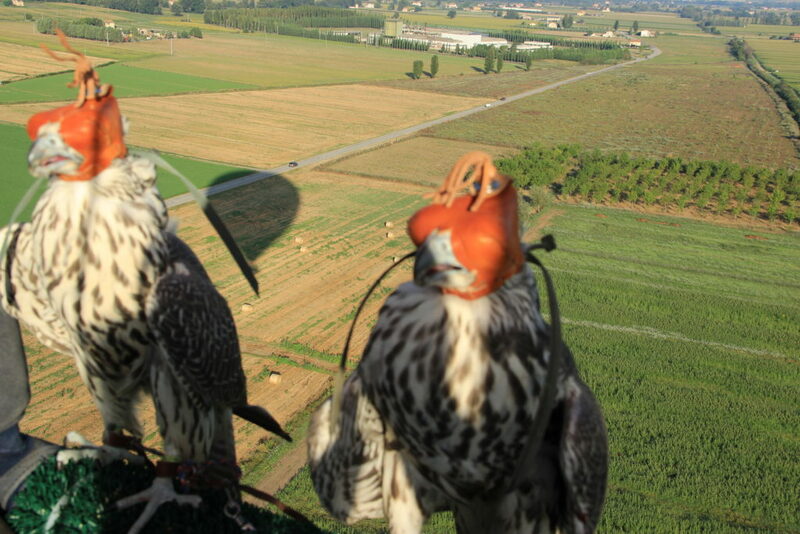 At 16 weeks, the falcons set off on a three-day road trip to Italy where the Balloon Adventures Italy team would imprint the birds on the hot-air balloons. After months of training, the falcons were ready for the final leg of their journey and to take part in this world-first experience. Now these magnificent creatures soar between the hot-air balloons in Dubai at 4 000ft above the desert. Sharing the airspace with these birds and watching as they circle the basket in full play is truly a one-of-a-kind encounter. With the desert dunes and Hajjar Mountains illuminated by the soft hues of the early morning sun, the hot-air balloon falconry experience allows you to see the tradition and heritage of this picturesque region from a new perspective. With one final swoop the birds settle on their falconers’ arms, eyes now covered by their hoods, as the pilot searches for the perfect spot to land. Anticipation builds as the balloon descends, bringing an end to this unforgettable journey. From its conception, the hot-air balloon falconry project has been undoubtedly one of the most unique and inspiring adventure activities in the world. Combining the freedom of hot-air ballooning and the tradition of falconry, visitors are allowed to see the world’s fastest animal in full flight in a display of strength and beauty. Join Balloon Adventures Italy for the most beautiful balloon flight in the world ! Balloon flight with breakfast and wine tasting.